The development of OPIDIN is based on the monitoring of water levels in the Upper Niger Basin and Inner Niger Delta by the Direction Nationale Hydraulique in Mali. This Section explains how these long term data are used for a reliable forecast of the flood and deflooding. In the Inner Niger Delta, flood height may reach six metres, slowly engulfing an area of 400 by 100 km. Fortuitously, the seasonal rise and retreat of the flood in this area has been measured daily by the DNH at several hydrological stations (Fig. 1) over many decades, producing a time series of great value. The water level is low from April to June, and begins to rise in July. In years of low river flow, the water reaches a height of about 3.5 m, peaking in late October. At high river flows, although the water level rises at the same daily rate, it does so over a longer period, peaking at 6 m by late December. Usually, lower-level floods cover floodplains for four months only (October-February), but high floods inundate them for twice as long (September-April). During the flooding (crue) and the deflooding (decrue) the water level rises and declines 3-5 cm per day. This gives the opportunity to predict the flood level in a week or in a fortnight. The water level in Mopti is in the dry period, on average, 100 cm on the local scale. 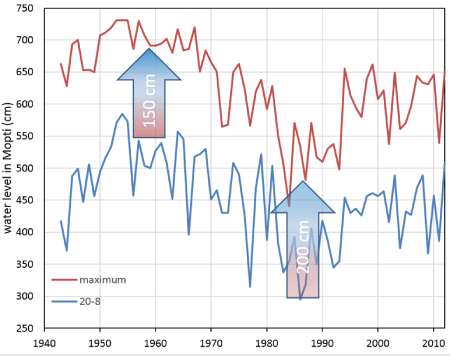 In dry years, the flood level rises 380 cm above this level, but in wet years more than 600 cm (Fig. 2). The water level in June, and even in July, cannot be used to foretell the peak flood level. However, when the water level in August is still low, one can be rather sure that also the maximum flood level will be low too, while a high floods may be foreseen if the water level in August is high. When the water level in Mopti on 1 August is 200 cm, it is possible to predict that the maximal flood level will be reached already in October a peak level of about 500 cm, while it is at the same date already 400 cm, we may predict that the peak flood level will be reached in November and be about 700 cm. The scattering around the regression line is rather wide, so the predicted level is not yet precise. Ten days later, the prediction is already better and on 30 August, we may indicate rather accurate the peak flood level and also when it will be reached. As an example, Figs. 6 and 7 show the relationship between the level of the peak flood and the water level reached on 20 August. During the course of September, the predictions for the flood level become more precise, but the date at which the peak is reached remains difficult to predict. All details regarding the methods are given in a report. To know the predicted flood level, go to flood viewer. 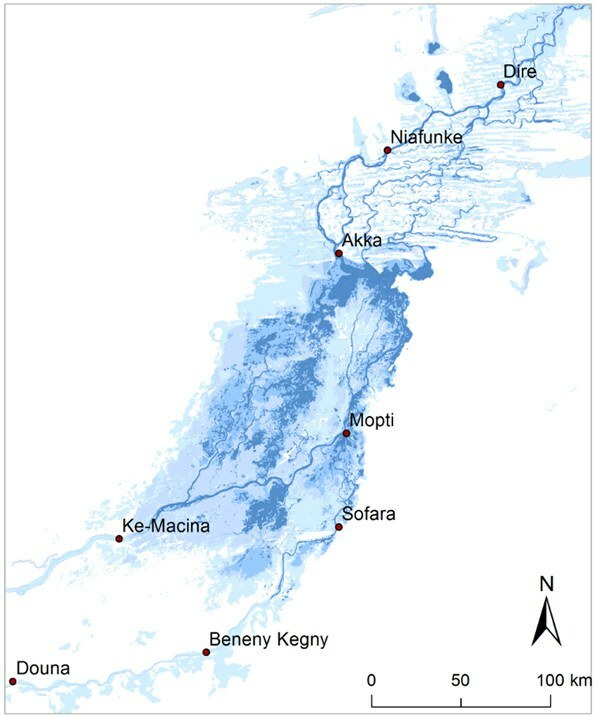 OPIDIN is a set of curvilinear regression equations based on the daily measurements of the water level in eight hydrometric stations in the Inner Niger Delta: Ke-Macina, Mopti, Akka, Niafunke, Dire, Douna, Beneny Kegny and Sofara (Fig. 1). For all these station long series of measurements are available: Mopti and Douna since 1922, Dire since 1931 and Akka since 1955. The most important station for us is Mopti since it measures the water level after the Bani has joined the Niger River. Also Akka is important due to its central position in the Inner Niger Delta. Fig. 1. The eight hydrometric stations along the Lower Bani and in the Inner Niger Delta used in OPIDIN. 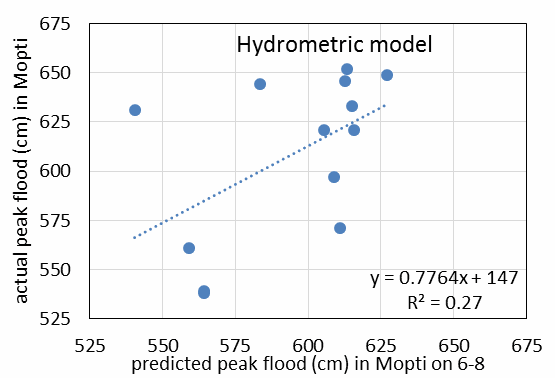 We calculated the relationship between the peak flood level in Mopti, in Akka and in Dire as a function of the water in Mopti on 1 August, 5 August, 10 August, etc. until 10 October. The predicted values for the days between were interpolated. The same calculations were done for the peak flood level, but also for the date at which the peak flood is reached. The 95% confidence interval was calculated. 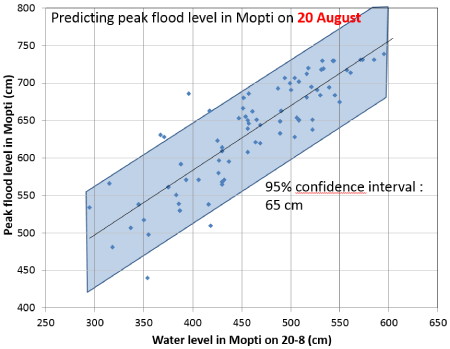 The result is a very large table from which the predicted peak flood (level and date ± 95% confidence interval) in Mopti, Akka and Dire is given as function of the large range of water levels for every day between 1 August and 15 October. Sélingué reservoir has changed the seasonal variation in the flow of the Niger. During the (early) rainy season, a part of the water is stored to fill the reservoir, which is emptied during the dry season. The Sélingué reservoir is used since 1982. To take its impact into account, the reservoir was entered as a dummy variable in the multiple regression equations; more details are given a . The outcome of these calculations is given in the floodviewer. Fig. 2. 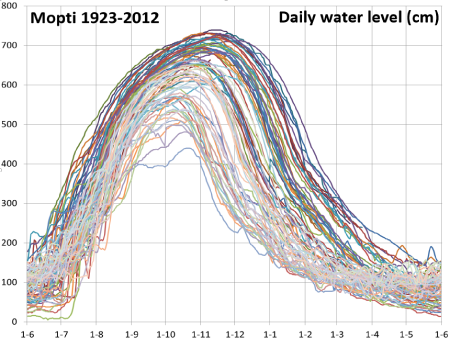 The variation in water level (cm) in Mopti since 1923 between 1 June and 1 June the next year. When the flood is low, the peak is reached in early October, but in wet years, the peak is more than a month later. OPIDIN uses this data set to predict the peak flood in relation to the water level measured 2-3 months before. Fig. 3. This graph shows the year-to-year variation in the peak flood level in Mopti since 1943 (red line) and for the same period the water level on 20th August (blue line). If the water level in Mopti on 20th August is 300 cm, the peak is 200 cm higher, but if the water level on 20-8 is 550 cm, the difference is less, 150 cm. Fig. 4. The same data shown in the graph above, but now plotted against each other. The linear regression line is shown. The 95% confidence interval amounts to 65 cm. Later in the season, the interval gradually declines to 12 cm. As described in the previous section, OPIDIN is based on the measurements of the water level in Mopti in August-October. Since the water level in Mopti is determined by the rainfall in the Niger Basin upstream of Mopti during the preceding weeks, an alternative might be to base the prediction of the flood on the cumulative rainfall in the preceding weeks. If possible, the big advantage would be that the flood prediction can be advanced a fortnight, or possibly even more. The daily rainfall is given on the FEWS website. This site gives for entire Africa the estimated actual daily rainfall, but also the rainfall for the last six days and the forecasted rainfall for the coming six days. We downloaded the 4896 daily rainfall maps since 1 January 2001 in a GIS system and calculated the total daily average rainfall for eight sections of the Upper Niger Basin, two from Guinea, split up for the Niger (N1) and the Bani (B1) and six from Mali (Bani: B2 and B3 and Niger: N2 and N3, Delta: D2 and D3); see Fig. 5. The data were used to calculate per year the cumulative rainfall in these eight sections during the course of July, August and September and relate this to the peak flood later in the year. To make a long story short, we were not able to improve the flood prediction when we used these meteorological data instead of the hydrometric measurements in Mopti. Fig. 5. Map showing the eight sections within the Upper Niger Basin (border indicated in red) for which we calculated the daily rainfall such as given on the FEWS-site. The maps show, as example, the rainfall on 20-8-2013, with yellow = <5 mm rain, blue = 40-60 mm and red = 180-250 mm. . The best option appeared to be to combine the hydrometric and meteorological measurements. We investigated several ways to combine both data set and finally made the choice to run the original hydrometric regression equations in OPIDIN to predict the peak level and the timing of the flood and thereafter to calculate for all years since 2001 the difference between the predicted and actual flood and regressed this error against the rainfall in the Upper Niger Basin during the preceding weeks. This approach is statistically simple, but it is also logical. The water level measured in Mopti in August or September depends on the rainfall upstream since June, but is fully independent of the most recent rainfall in the Upper Basin since it will take time before the rainfall some 100 kms from Mopti has an impact on the rising water level in the Inner Niger Delta. Hence the recent rainfall can be used in OPIDIN as a tool to improve the prediction, statistically independent of the most recent measurement of the water level. The methodology may be illustrated with an example. In 2013, the water level in Mopti was until 11 August so low that we feared for a very low flood. Fortunately, the rainfall in the Upper Niger Basin in early August has been higher than normal for this time of the year. Hence we expected that the next fortnight the water level in the Inner Niger Delta would go up faster than the weeks before and that the peak flood level would be much higher than predicted from the water level measured in Mopti on 11 August. Indeed there was a fast increase of the water level between 11 and 21 August 2013 by which the prediction of the flood level could be upgraded in late August. In other words, due to the late start of the rainy season in 2013, the OPIDIN predictions were too low until late August, but by integrating the most recent rainfall in the model, we could correctly predict the peak flood from early August onwards, about a fortnight earlier than OPIDIN as hydrometric model. Using hydrological models, it would be possible to estimate the time between the rainfall somewhere in the Upper Niger at a certain day and the time it takes before this water has reached Mopti. An alternative is to do statistical analyses to find out how OPIDIN can be improved the most when using the recent rainfall. First, we did so including or excluding the rainfall in the Inner Niger Delta itself and found that inclusion of the local rainfall in the northern Inner Niger Delta did not improve the prediction. After that we calculated for each day between 21 July and 16 October the predictive power of the cumulative rainfall during the preceding 1, 2, 3, …, 28 days in the entire upper Bani and Niger and southern part of the Inner Niger Delta combined. 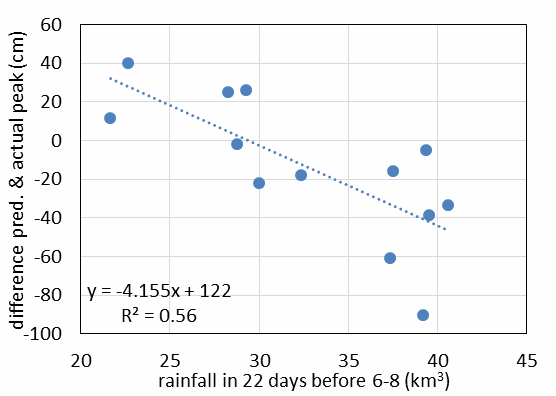 For nearly all dates the correlation was low when we added the rainfall for the preceding 1,2,3 or 4 days, but the correlations improved when the rainfall was added over a longer period up to 20-25 days, after which there was no further increase and for most dates a decline of the correlation. We decided to sum up the rainfall for a time period of 18 days for each date and to use this fixed time period for all dates between 21 July and 15 September (e.g. rainfall added for 6-23 July on 23 July, rainfall added for 7-24 July on 24 July, etc.). The peak of the flood in the Bani River is in Douna about 20 days earlier than in Sofara (230 km downstream of Douna) and a similar retardation exists for the Niger River between Ke-Macina and Mopti. To this must be added some days between the Douna and the Upper Bani and about a week between Ke-Macina and the Upper Niger. Thus, the increase of the water level in Mopti during the raining season, depends on the rainfall in the Guinean part of the catchment area (Bani1 and Niger1 in the map given above) four weeks earlier. However, not more than half of the rain in the catchment area upstream of the Inner Niger Delta falls in Bani1 (9.2%) and Niger1 (40.2%). The retardation between rainfall and water level in Mopti will be three weeks or less for the rain falling between Mopti and the Malian part of the Upper Niger Basin. Thus, the calculated optimal average time span of 18 days appears to be a realistic compromise. Fig. 6. The actual peak flood (cm) in Mopti plotted against the predicted peak flood on 6 August during 13 years (2001-2013). The prediction is solely based on water level in Mopti on 6 August (hydro model). Fig.7. The difference between the actual peak flood and the predicted peak flood on 6 August (taken from the graph above) plotted against the rainfall in the Upper Niger and Upper Bani during 18 days before 6 August. Fig. 8. The actual peak flood (cm) in Mopti plotted against the predicted peak flood on 6 August during 13 years (2001-2013). The prediction is based on the water level in Mopti on 6 August corrected for the rainfall in 18 days before 6 August ("hydro+meteo model"). Figs. 6-8 show in a nutshell how hydro-meteo-prediction in OPIDIN improves the original hydro-prediction. Fig. 6 shows for 6 August during the last 13 years the relationship between the predicted and the actual peak flood in Mopti. The scattering around the regression line is large. The deviation from the calculated linear regression line is plotted against the rainfall in the 18 days before 6 August in Fig. 7. The regression line in Fig. 7 can now be used to improve the flood prediction. The result is given in Fig. 8. Obviously, the prediction in the hydro-meteo-model (Fig. 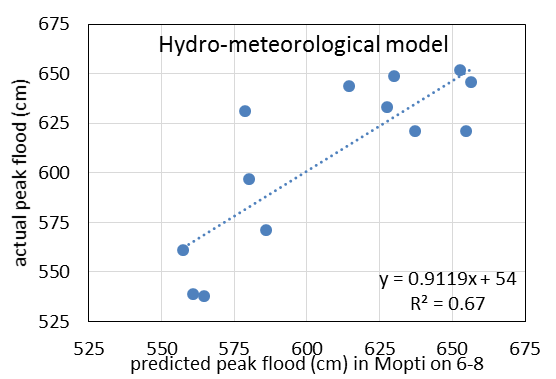 8) is much better than the prediction of the hydro-model (Fig. 6), as can be seen from the higher correlation. This does not imply that the hydro-meteo-prediction is all years closer to the truth than the hydro-prediction. The statistical analysis shows that the average error becomes less and thus also the risk of a wrong prediction. The scattering around the regression lines in Fig. 8 is used to estimate the confidence interval of the predictions. What is shown here for 6 August, was done for all dates between 26 July and 15 September. The rainfall in the preceding weeks has a large impact on the prediction in early August, but it becomes less later in the season and the correction is very small in September. The water level in August or September may also be used to predict the date at which the water level has declined to a certain level. We selected the date at which the water level during the deflooding has declined to 200 cm and 100 cm at the gauge of Akka, since that is the level at which nearly all floodplains are emersed. In the same way as described above for de peak flood, we calculated curvilinear regression equations relating the date of deflooding (200 or 100 cm at Akka) to water level in Mopti on 1, 10, 15 August, etc. The result is given in deflooding.